Germany underwent two periods of dictatorial repression in the twentieth century, first under Hitler and the Nazis in the late 1930s and early 1940s and then under the communist German Democratic Republic from 1945 until the Berlin Wall fell in 1989. The abuses of human rights under the Nazis are well known and now abundantly documented. 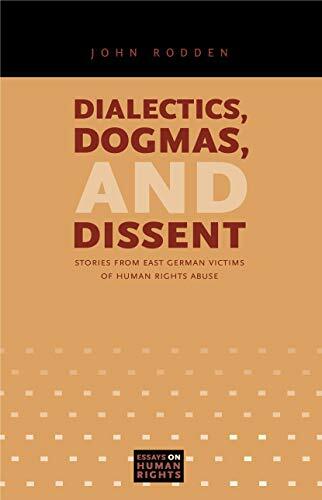 The abuses that occurred during the period of the GDR, however, are not so well known and are poorly documented. Through his interviews with survivors of GDR repression, John Rodden seeks to add to the history of this dark period. He reveals the many different ways in which ordinary people suffered at the hands of a brutal regime and its secret police enforcers, the Stasi. Some presented here are heroes; some are survivors, including those who played along to get along. As one teacher who conformed to stay safe admitted to Rodden, "It was a nation that, by cutting us off from the truth, made cowards of us all."